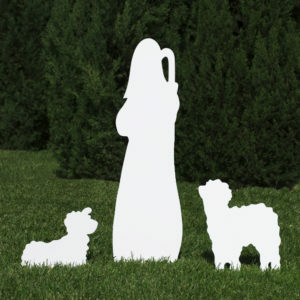 To help families celebrate their Christian faith with the finest American-made outdoor nativity sets and decorative goods. 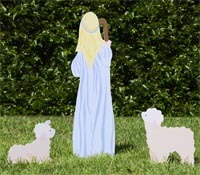 Outdoor nativity sets used to fade. Their paint would peel. They were bulky and hard to store. Shopping for a yard nativity scene was difficult. And when you did find nativity sets for sale, they were expensive. 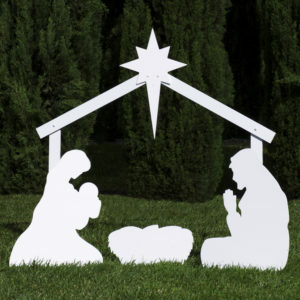 Motivated by friends and neighbors looking for scenes of their own, we set out to create better, more durable nativity scenes at affordable prices. 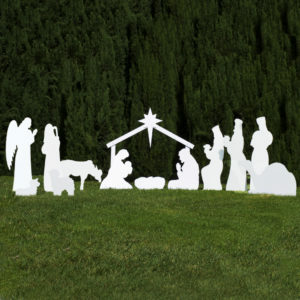 Founded in 2008, Outdoor Nativity Store is a family-run company located in Southern California. Combining a timeless visual sensibility with modern materials, our long-lasting, American-made products are the beginning of a new tradition. Today our outdoor nativity sets share the good news of Jesus throughout America and around the world. We are glad to share our JOY for the true meaning of Christmas and hope that even more people will come to know our Savior! Since 2008, our outdoor nativity scenes have withstood the harshest winters and the toughest critics. Through careful refinement and customer feedback, we’ve created a yard nativity set that all American’s can enjoy in front of their home or church and add to for years to come. Our all-weather PVC plastic and UV-resistant colors stand up to the sunlight in the south and the snow in the north (and most weather conditions in-between). Making our outdoor nativity scenes anywhere but the United States was never a question. By being involved in every step of the process, from design and manufacturing to fulfillment and customer service, we can ensure that customers receive only the absolute best quality products—without compromise. We proudly source our components and materials from American suppliers, helping to support jobs across the country. Customer satisfaction is our number one priority. That’s why we’re trusted by over 10,000 Christians. From our secure, easy-to-use website to our no-hassle returns policy, we strive to take the stress out of online purchases. Whether you’re inquiring about our products for the first time or ordering additional pieces for your outdoor nativity scene, our knowledgeable staff is happy to assist you. Just get in touch. 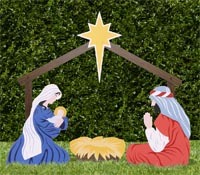 While other manufacturers of outdoor nativity scenes and Christian decorative goods rely upon the same stock designs, we take great care to develop original artwork and exceptional designs. Modern yet timeless, bold yet elegant, our manger scenes, yard signs, and wall banners make a big impact without looking overly commercial or cartoonish. 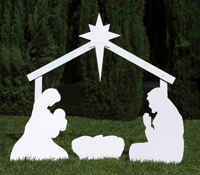 With Outdoor Nativity Store, you can expect to stand out. Our endeavor to share the Good News extends beyond our products. We’ve grown an enthusiastic community, with over 40,000 followers on Facebook. On our blog you’ll find inspirational stories and helpful tips for celebrating your Christian faith at Christmas and throughout the year.